If you own Alcatel Go Watch, please do leave your feedback too. Alcatel Go Watch is a smartwatch that was launched in September 2015. The phone has water, dust and shock resistance, push notifications, completely customizable design, fun graphics to show your emotions, coating with resistance to fingerprint and smudge are its major highlights. Alcatel Go Watch has a stylish and sturdy built that comes with 1.22 inch IPS circular capacitive touch screen LCD dial, 240 x 204 pixels resolution, 256K colours and 258PPI pixel density. It has a dimension of 49.2 x 22 x 3.5 mm and its weight is 55 grams. It has 49.2mm plastic dial in Black and White colours and hot-swappable rubber strap in Black and White colours. Alcatel Go Watch is built with proprietary Operating System, 8MB RAM. The phone is IP67 certified and is resistant to water up 1 meter, to shock and to dust. Accelerometer, gyroscope, altimeter, heart rate monitor, e-compass are available. It has 2 buttons. You can tap the screen to avail the fitness and health features. Calendars, anti-lost alarm, smart alarm and vibration motor are in-built. Alcatel Go Watch has an internal storage of 18MB. Alcatel Go Watch is loaded with Li-ion 225mAh battery having life up to 2 days and it can be charged by using a proprietary cable. It is compatible with Android version 4.3+, iOS 7+, and iPhone 4s+. Users can enjoy connectivity through Bluetooth 4.0+. 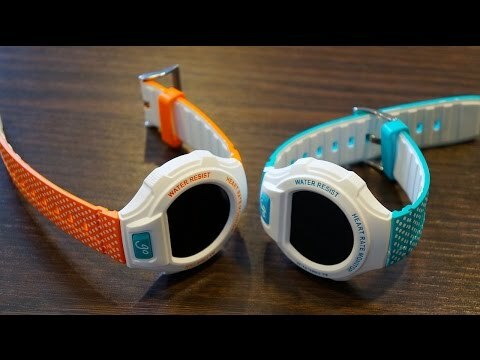 Alcatel Go Watch faces competition from Intex IRist Pro. They fall in a similar price range, however the Alacatel Go can be a superior buy due to its greater features.